Paul E E Barbier was a respected member of staff at the University of South Wales and Monmouthshire (now Cardiff University), as well as being a recognised name within the wider community in Cardiff. After moving there in 1883 with his family, he made a concerted effort to become involved with local cultural societies and in particular was interested in the conservation of the Welsh language. The archive testifies to his sustained commitment to Welsh throughout his time in the Welsh capital. Photograph of Paul E E Barbier, courtesy of Delphine Isaaman. I have also found evidence in the archive that Paul E E Barbier was a member of the Société Nationale des Professeurs de Français en Grande-Bretagne (SNPF). Founded in 1881, the society still exists to promote French culture, as well as the teaching of the French language. Through his public lectures and contributions to the press gathered in the archive, Barbier also promoted the Entente Cordiale, a series of agreements signed in 1904 which settled a number of controversial matters and sought to bring an end to antagonisms between Great Britain and France. In an obituary from the South Wales Echo dated 26th September 1921, I learnt that the secretary of King Edward VII sent Paul Barbier a letter of thanks in the name of the King for his public spirit. I’ve searched the archive for this letter, unfortunately without success so far, but it would be great to see it! As well as speaking and writing perfect English along with his native French, Professor Barbier had a keen interest in the Welsh language. From 1897 he was on the committee for the National Eisteddfod, the annual festival held in a different Welsh town or city each year. As mentioned in my last blog post, I have found the Welsh Newspapers Online website very useful in obtaining information about Paul E E Barbier. One article for The Western Mail (7th July 1899) entitled ‘Mons. P Barbier on the Eisteddfodd’ explains that he contributed to a series of short newspaper articles about the National Eisteddfodd. In the same article, Paul Barbier asserts that ‘the Welsh nation owes its spirit of culture to the Eisteddfodd’. Western Mail, 7th July 1899. I understand that during the late 1800s very little attention was paid to the Welsh language in Cardiff, nonetheless it seems that Paul E E Barbier devoted his time and attention to the study of the language. Throughout the archive I have found evidence of Welsh being used. It is apparent in exercise books and letters from Paul E E Barbier. When the University of South Wales and Monmouthshire first opened, there was no option to study Welsh. However, Paul E E Barbier’s son, Paul E A Barbier, studied for a MA in French and Welsh – this suggests that Paul E E Barbier might have had something to do with the pioneering of Welsh studies. Evidence from newspaper articles explain that Barbier delivered lectures about Welsh language and culture. An article from The South Wales Echo (2nd February 1899) gives an account of his lecture ‘My Impressions of Wales and Welshmen’. According to the article, there ‘was a full attendance’ and the lecture ‘was full of humour and literary charm’. The article also cites a wonderful quote from the lecture, in which Paul E E Barbier says ‘if French were the language of men, German of soldiers, Spanish of God’s Saints, Italian of women and English of birds, surely Welsh was that of angels!’. Pum deg mlynedd yn ôl darlledodd y BBC ddarlith gan Saunders Lewis (cyn-aelod o staff Prifysgol Caerdydd), dan y teitl ‘Tynged yr Iaith’: ei fwriad oedd sbarduno Cymry Cymraeg i fynnu eu hawliau i ddefnyddio’r iaith Gymraeg; rhywbeth y honnodd fyddai’n gyfystyr a ‘chwyldro’ . Cyn 1962 nid oedd gan siaradwyr Cymraeg hawliau cyfreithiol i wasanaethau yn yr iaith, ac roedd y cefndir hanesyddol yn un o ragfarn a difaterwch – o’r Ddeddf Uno yn 1536 a waharddodd yr iaith mewn llywodraeth, hyd at yr ugeinfed ganrif. [An exhibition based on the 1962 BBC lecture by Saunders Lewis – ‘Tynged yr Iaith’, on the fate of the Welsh language – and its immense effect on society in the fifty years afterwards]. The plain man’s pathway to Heaven, or, The hitchhiker’s guide to the galaxy? 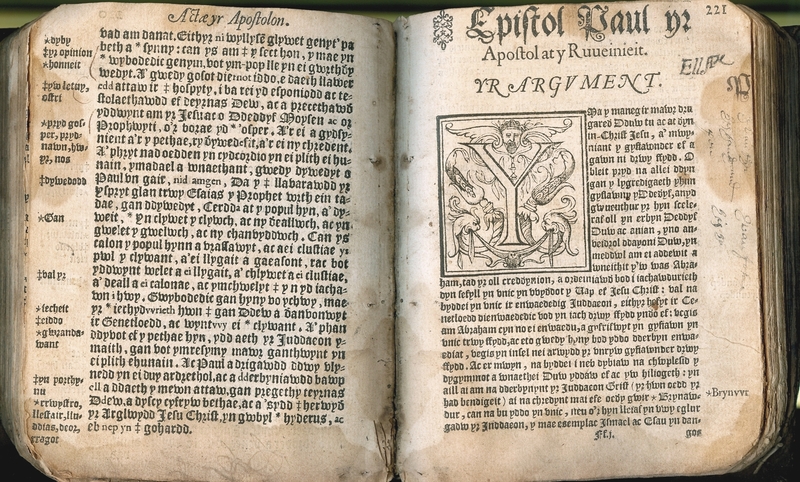 Among the older Welsh books in the Salisbury Collection at Cardiff we have the two seventeenth century editions of “Llwybr hyffordd yn cyfarwyddo yr anghyfarwydd i’r nefoedd” by the Puritan Arthur Dent (d. 1607), originally published in English as “The plain man’s pathway to heaven” in 1601. When I first came across this title I was struck at once by the author’s name being the same as that of the hapless main character of Douglas Adams’ “The hitchhiker’s guide to the galaxy”, and indeed, the similarity of the title. I filed the information away in the recesses of my memory, used the catalogue record whenever I wanted an example to explain the display of a uniform title for a translated work, and thought that one day I would look into it further. As is the way with such things, others got there before me, as you can read here on the h2g2 online guide (“The guide to Life, the Universe, and Everything”). The site’s article mentions Douglas Adams’ interview of March 1987, in which he said that he had been contacted by someone with a research interest in the period. The (unnamed) researcher had jumped to the same conclusion, pushing it further by finding many parallels in the respective texts. Adams stated that he had never heard of the book or of its author Arthur Dent, so the similarity really is a pure coincidence. Both works, as article and interview point out, are a version of the “Everyman” story, the innocent in a strange world which may or may not be a version of our own world which must be explained to him. (Bunyan’s Pilgrim’s Progress is probably the best-known later example of this popular genre). “The hitchhiker’s guide to the galaxy” has not, as far as I am aware, been translated into Welsh, but “The plain man’s pathway to heaven” was, first appearing in 1630 and again in 1682. 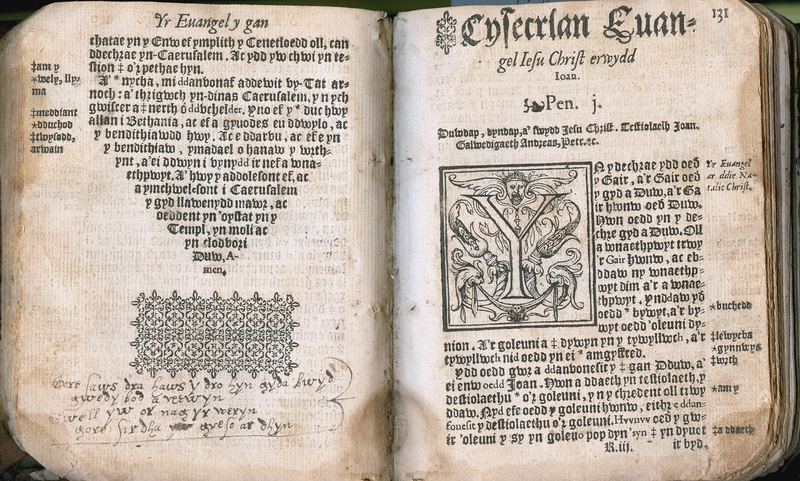 It is one of several translations of religious works made by Robert Llwyd, Vicar of Chirk (1565-1655), intended to improve Welsh devotional life by making suitable books available in the Welsh language. While there are a number of locations for the 2nd edition of 1682, the 1st Welsh edition of 1630 is rarer (it is also held at the National Library of Wales, the British Library, and Bangor University Library). As was usual with Welsh books before the lapsing of the Licensing Act in 1695, it was printed in London. The printer, Nicholas Okes (d. 1645), is better known for his editions of Elizabethan and Jacobean plays, including his1st Quarto of Shakespeare’s King Lear and Othello. 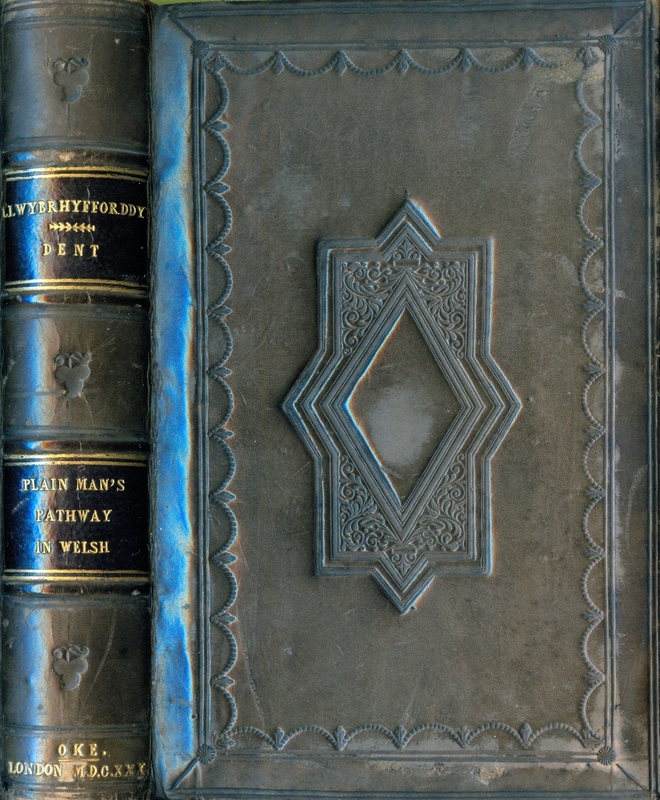 The copy at Cardiff formerly belonged to Victorian Bible collector James Dix of Bristol (and is inscribed many times over with the name of an earlier owner, Ellis Powell, 1740). While the title-page is worn, the book is otherwise in good condition. Ar y 7fed o Hydref 1567 cyhoeddwyd llyfr pwysig yn hanes y Beibl ac yn sgîl hynny yr iaith Gymraeg: Testament Newydd William Salesbury a’r Esgob Richard Davies. Yn 1563 y pasiwyd y Ddeddf a fynnodd gael cyfieithiadau o’r Ysgrythyrau a’r Llyfr Gweddi Gyffredin yn Gymraeg ble bynnag yr oedd yr iaith yn arferedig: heb y Beibl yn Gymraeg, byddai hanes yr iaith wedi bod yn wahanol iawn. Un o wŷr y Dadeni a’r Diwygiad oedd William Salesbury, yn ysgolhaig gyda’i syniadau ei hun am darddiad geiriau a’r orgraff. 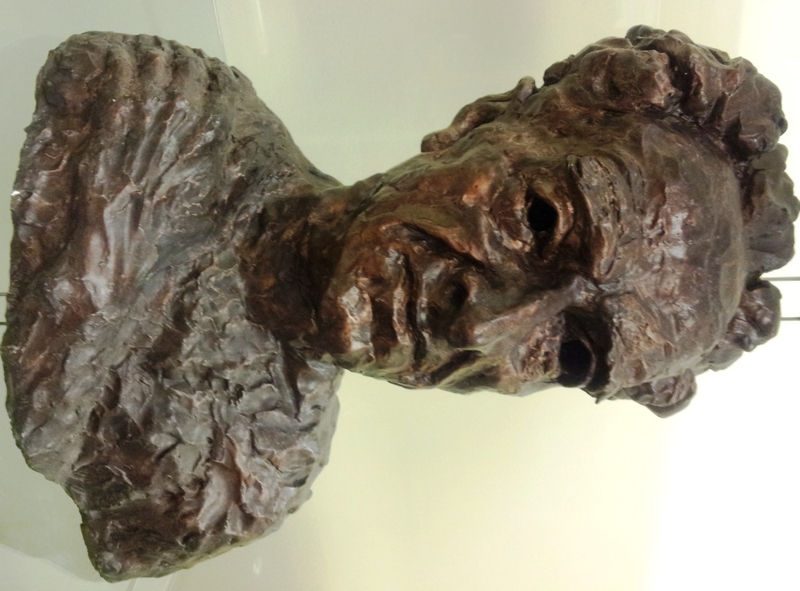 Yn y diwedd fe ffraeodd Salesbury a Davies ar faterion ieithyddol. 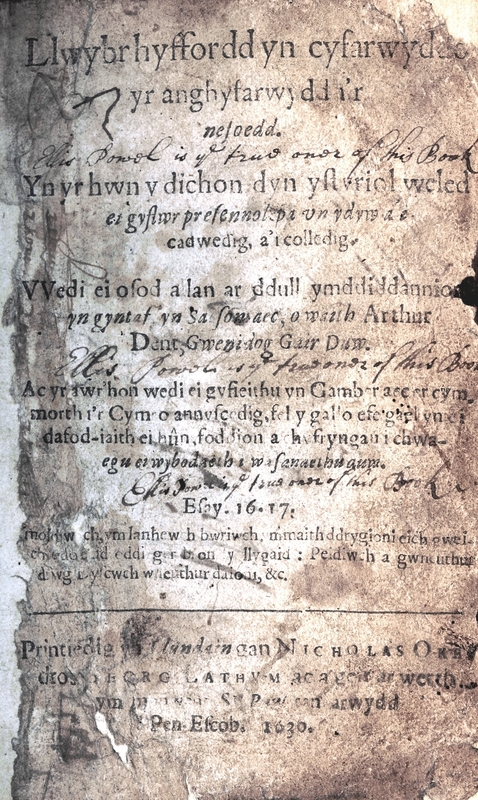 Cam tuag at y Beibl cyfan yn Gymraeg oedd y Testament Newydd 1567 i fod, ond yn y pen draw yr Esgob William Morgan gafodd y fraint o gyflwyno’r Beibl cyfan yn 1588. Cyffrous felly yw cyhoeddi ein bod wedi darganfod copi o’r Testament Newydd 1567 ymhlith rhoddion diweddar, ac mor agos at benblwydd ei gyhoeddi ar y 7fed o Hydref!